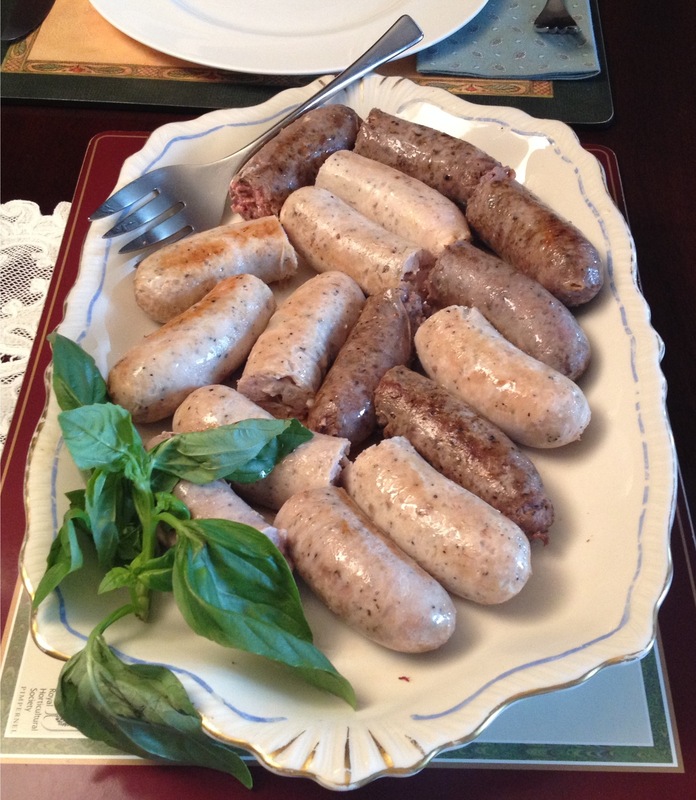 A variety of chicken and lamb sausages. along with some sausages and a big beautiful fruit salad. Of course, since this was a party, some of us started with mimosas (made with Prosecco) or Bloody Marys. 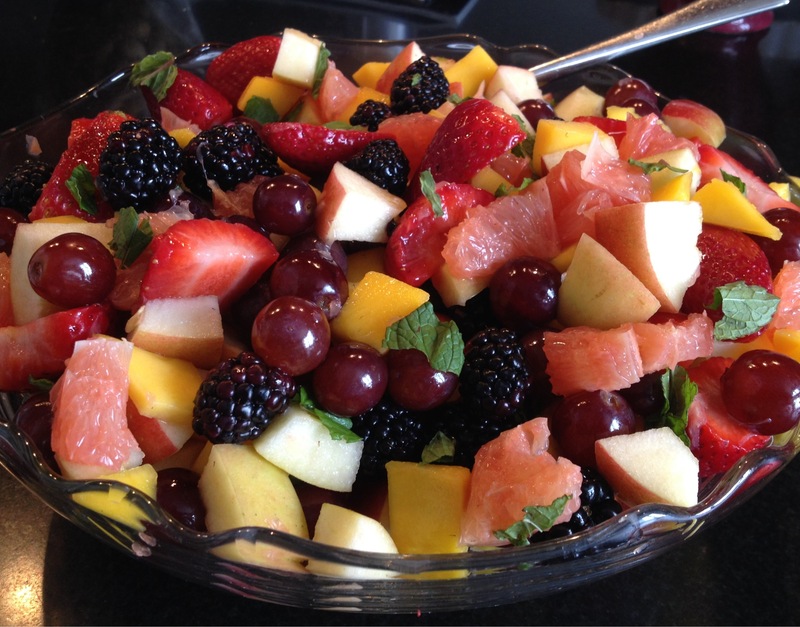 Luscious fruit salad garnished with torn mint leaves. Now the thing I was fretting about late into Saturday night, was how was I going to keep the first cooked waffles warm while continuing to make them and have the full batch ready for everyone. A little research online came up with a very low temperature in your oven and put them straight on the racks, not on a plate or cookie sheet as that would cause moisture to form and sogginess to beset them. So I did this, but the lowest my oven would go was 175 degrees and they were recommending 150. So I turned the oven off and on, afraid they would dry out. In hindsight, I should have just left it on at 175 the whole time, as they could have been a bit hotter. Whisk the flour, baking powder and salt together in a medium bowl. In another bowl, whisk the eggs, milk, melted butter and vanilla extract. Pour the milk mixture over the dry mixture and whisk until just combined. Let sit five minutes to “develop” (just a fancy word for letting the baking powder activate). Meanwhile, heat your waffle iron. Pour, or ladle, enough batter to cover about 2/3 of the surface (the rest will spread once you close the top). Most waffle irons have a handy light that goes on or off, signaling the waffles are ready. A sure sign of doneness is once you see all the steam has stopped shooting out. Have a LOVEly brunch wherever you are! Oh I so love waffles, they are my favorite breakfast or brunch food besides eggs benedict. 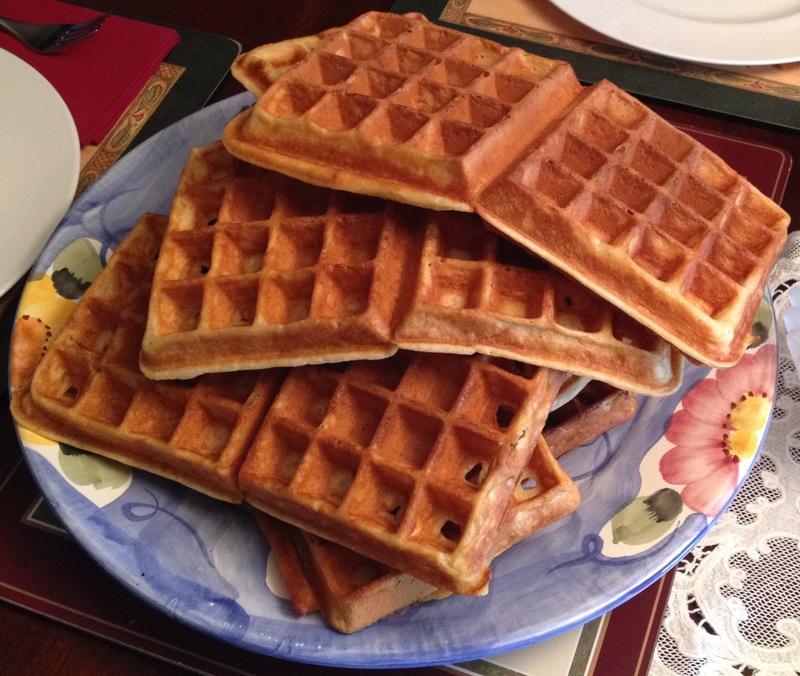 Your waffles look great, Jenny’s recipe is simple and I love that. Now I think I will make some waffles this morning. You inspired me. LOL!!! You go Suzanne!!! They were great – hope they turn out delicious for you! Oh this post has totally inspired me to bring out my waffle iron – I have not used it for soooo long! Afra – I didn’t either – until last Sunday. Enjoy!! Great tip about the waffles. I have always resisted making them for company for just the reason you mentioned – about keeping them warm. Wonderful meal you made. I am sure they will remember it with great fondness. Exactly!! This wasn’t perfect as waffles are always the best right out of the iron but this was pretty darn good! I must get my waffle iron out and use it oftener! This is a great brunch party, Mary. Thanks Angie. Yes, we all need to pull it out more often! 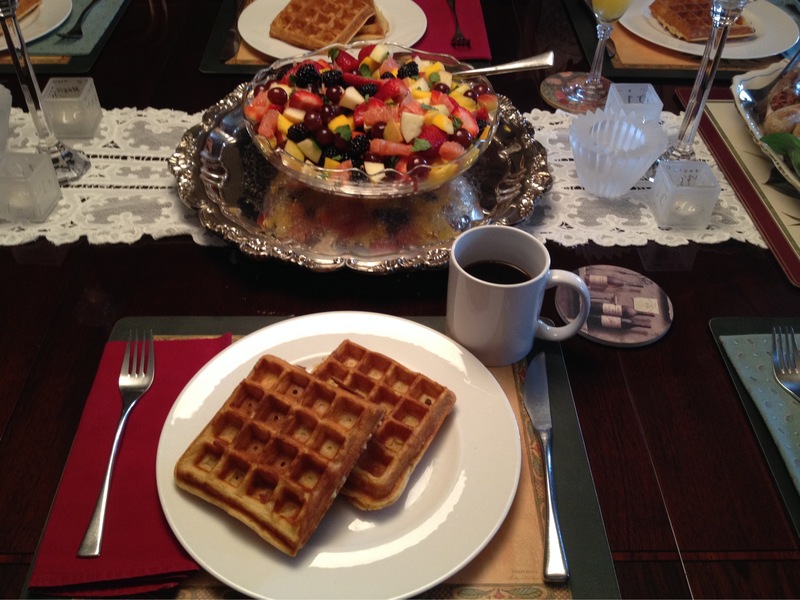 Those waffles and that GIANT bowl of fruit! Where do I line up!? LOL! Francesca! – you’re so cute!! I always make a large bowl of fruit salad on Sundays and then we can have a quick bowl of fruit for breakfast during the week when it’s hectic with getting to work. This bowl, however, with so many people, did not yield enough leftovers. I like the idea of putting them on the oven rack to keep warm. I always end up with the bottom one on the plate and not the nice crispy one on the top. Those waffles look divine, as does the rest of your brunch. I’m in desperate need of a waffle now you’ve tempted me. Too bad the dog chewed up my waffle machine! Thank you!! Definitely time to go buy a new waffle maker! What a lovely spread! I’m certain your company appreciated your hospitality! They did Liz! They’re all so cute!! Goodness, one look at that sausage and I am so hungry now! 🙂 They were very good – from Fairway! I prefer waffles to pancakes – I love the crispy outside! Super brunch, love the sausages. And I just wiped the dust of my waffle iron too this weekend (cheated with cinnamon roll Pillsbury dough). Will keep your recipe on hand maybe for next weekend. Evelyne – as you could see, this recipe is super easy – and super delicious!! Give it a go and let me know how it turns out for you! Wow!!! This looks like a breakfast I would love to sit down to! Looks delish!…Waffles and all! 🙂 Bring on the fork and knife. What a nice brunch, Mary! It’s been ages since I’ve enjoyed waffles and yours, topped with that gorgeous fruit, would be a real treat. I’m sure your guests loved them. John, you’re so sweet!! They ate everything and my husband said if I would have made more waffles, they would have been gone too. Only one tiny piece of sausage and a little bit of fruit remained. Well I think so too Tandy!! Get on with it and make some waffles! Waffles! I haven’t had waffles in forever. I have been searching for a waffle iron that makes square or rectangular waffles like yours. The only irons available at the moment are round/heart shaped ones. I am fussy, I know. Mandy – mine is a traditional Belgian waffle iron. I’m sure you could find one online. And it’s good to be fussy. I wouldn’t want a round or heart-shaped one either! These waffles look delicious! This is the perfect brunch! Yep!! Hope you buy a box, Barb, because it’s going to be really special and I know you’ll love it, plus you’ll be helping to feed hungry children worldwide, and that will make you sleep easier at night!! My first time to your site I think & these waffles look wonderful. I think waffles make a breakfast or brunch extra special, and I always wish I had a bigger waffle iron than I do so I could get them made more quickly. I love this recipe – it’s a tried and true favorite! 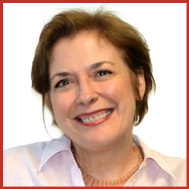 Hi Donalyn! Welcome! The tip I found on keeping them warm worked fairly well. Give it a go! How far upstate are you? We have a house in Columbia County which is upstate from the city but may be downstate from you.